In what is a sign of these difficult economic times, traditional, family-run trattorias and restaurants in Italy are closing shop at an alarming rate, only to be replaced by pretentious restaurants all too busy at turning unlikely ingredients into almost texture-less matters (foams, mousses, sponges…), horrible fast-food type pizzerias, or westernized Oriental food emporiums of little consequence. 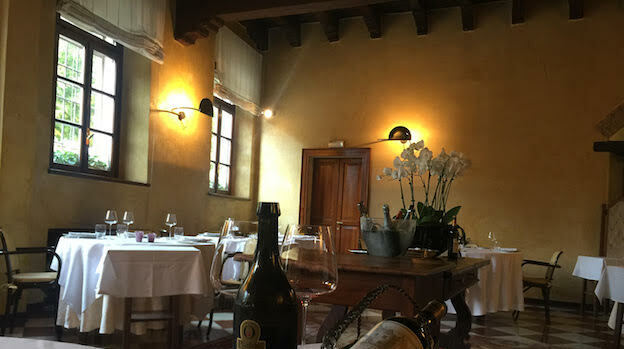 Then, just when you start thinking the country is becoming awash with a legion of dining spots that have no past (and no future), you have a wonderful meal at a place like Mantova’s Aquila Nigra and life immediately begins to make sense again. Aquila Nigra itself is not so old. The restaurant was founded in 1984, when owners Giorgio Bini and Vera Caffini needed to move to larger quarters to better serve their many, and continuously increasing, customers. Aquila Nigra translates to “black eagle” (aquila nera), the symbol of the contrada (neighborhood) where the restaurant and its historic home, the Palazzo delle Tre Cappe, are located. 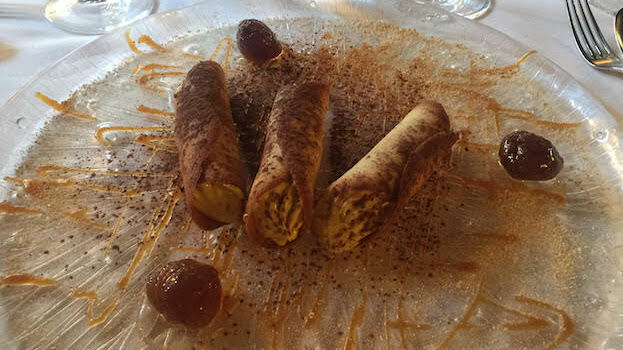 One of the finest bastions of traditional cooking in Italy, Aquila Nigra is a place where someone who actually knows how to cook is in charge. A meal here is very much like coming in from out of the cold, a warm wool blanket wraps around your shoulders on a cold and dark winter’s day. Everything harkens back to a time long gone by, from the large red marble fireplace and the high ceilings that characterize the refined internal dining room, the phlegmatic but very professional waiters and the owner, an older gentleman busy reading the newspaper out in front of the restaurant near the bar (a well stocked bar is always a very good sign, of course). 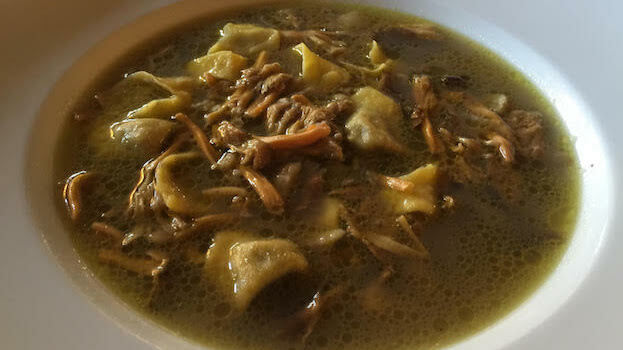 The menu is all about comfort food. 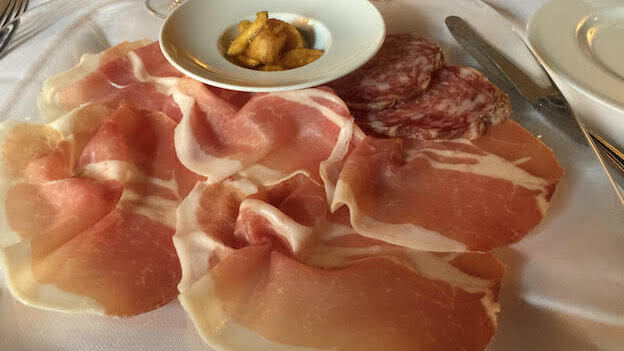 Precisely rendered tortelli di zucca and the extremely high quality salumi, such as the culatta and salame mantovano, have me wishing I lived in Mantova! I could easily have a second portion of both. Only the fact I am in the company of a lady holds me back from bringing my more slothful instincts out into full view. The NV Luigi Virgili Lambrusco Mantovano Imperiale Pjaföc matches brilliantly with both dishes, in a way few other wines can. Bright and bubbly, with strong but precise aromas and flavors of strawberry, ripe black cherry, vanilla and sweet spices, this specific Lambrusco wine (a blend of Lambrusco Salamino, Lambrusco Ruperti and Ancellotta) is a lot of fun just on its own. I never cease to be amazed how well Lambrusco matches with the hearty and not exactly lean local cuisine. There is something almost magical about how a well-made Lambrusco (such as the one made by Virgili) pairs with the local salame mantovano and the tortelli, that is truly hard to put into words. 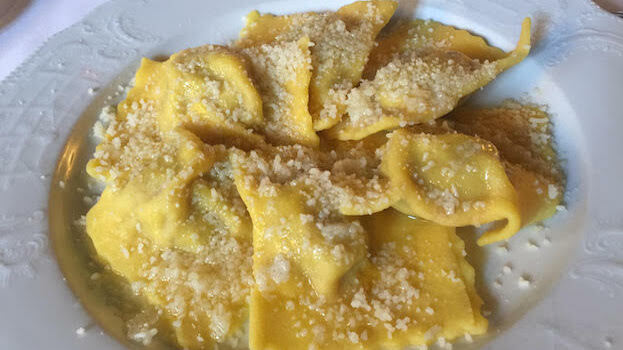 One morsel of the salumi or tortelli plus one sip of the Lambrusco is gastronomic nirvana. The loin of hare is another crowd pleaser: the meat is juicy and tender, its delicate underlying bitterness very well buffered by the sweetness of the blackcurrants and the texture of the chestnuts. This is another dish I could easily have seconds of. 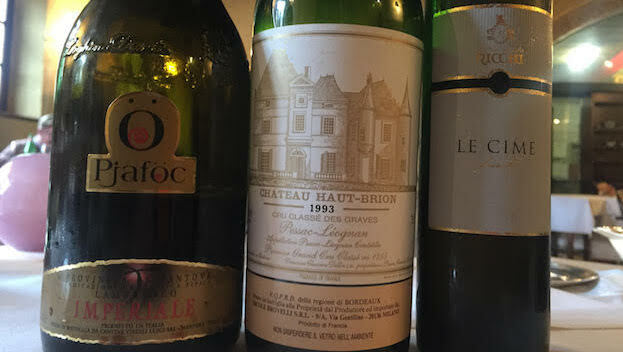 The 1993 Château Haut Brion turns out to be just as big a star as the dish. From an unheralded vintage, this magnificent Premier Cru Classé is drinking beautifully and boasts a lovely penetrating perfume (cassis, violet, cedar, graphite and botanical herbs) plus a delicate texture. It serves as a poignant remainder of just how much pleasure and food friendliness less famous Bordeaux vintages can deliver. At meal’s end, Giorgio Bini appears at our table with a 375ml bottle of what looks to be a sweet white wine. He previously had decanted the Haut Brion for us and had been pleasantly surprised when we asked him to join us for a glass or two, which he gratefully accepted before heading back to the bar. Clearly, Bini has been waiting for us to reach the dessert stage of our meal, and when the time comes, he makes sure to pop by holding the small bottle, telling us he wants us to try what is in his opinion a lovely local sweet white wine. The 2009 Ricchi Passito Bianco Le Cime (a wine I don’t remember having ever tried before) is a 50/50 blend of Garganega and Moscato Giallo. The grapes are air-dried for about 90 days and the wine is aged for anywhere from 15 to 20 months in small oak barrels, depending on the vintage. Luscious and moderately sweet, the wine showcases orange blossom, honey and grapefruit aromas and flavors. It pairs well with our cannoli and perhaps even better with the conversation. Thanks to the magic of wine, three people who don’t know each other much at all and have no trouble at all bonding.